Microsoft Windows Sandbox is lightweight desktop environment tailored for safely running applications in isolation. At Microsoft we regularly encounter these situations, so we developed Windows Sandbox: an isolated, temporary, desktop environment where you can run untrusted software without the fear of lasting impact to your PC. Any software installed in Windows Sandbox stays only in the sandbox and cannot affect your host. Once Windows Sandbox is closed, all the software with all its files and state are permanently deleted. - Part of Windows – everything required for this feature ships with Windows 10 Pro and Enterprise. No need to download a VHD! This enables the Windows Sandbox VM to benefit from hardware accelerated rendering, with Windows dynamically allocating graphics resources where they are needed across the host and guest. 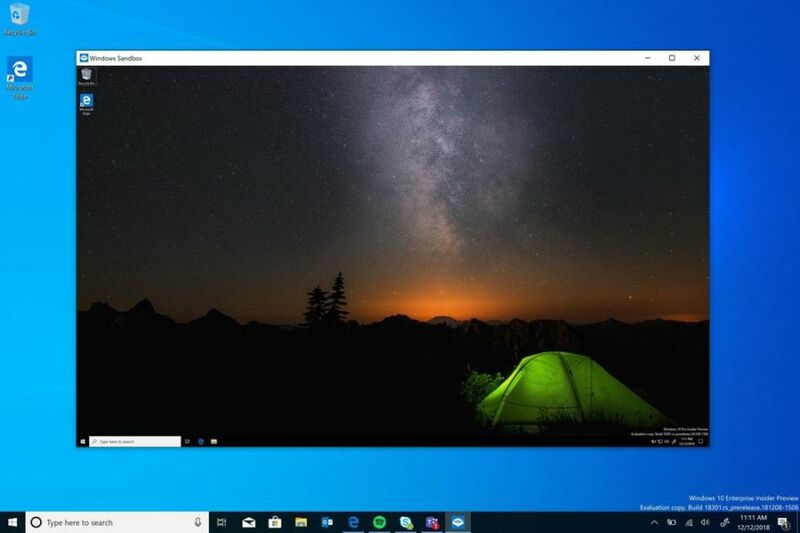 The result is improved performance and responsiveness for apps running in Windows Sandbox, as well as improved battery life for graphics-heavy use cases. To take advantage of these benefits, you’ll need a system with a compatible GPU and graphics drivers (WDDM 2.5 or newer). Incompatible systems will render apps in Windows Sandbox with Microsoft’s CPU-based rendering technology.